Bill's Blog: Five Million to One! Yes, those are the odds for getting a pair of tickets to be in the audience of Strictly Come Dancing when it is broadcast on Saturdays at Elstree Studios. When we applied for tickets a few weeks ago my scientific young friend said the odds are so long I'd never get any. We've been rooting for our good friend Debbie every week (we put bets on her at 25 to 1 at the start of the series), so imagine our delight when I got lucky and won tickets for last Saturday’s performance. ( No, Debbie couldn’t help as she only gets two guest tickets for each performance). Anyway getting up early we arrived at the venue at 8.15 in the morning to be confronted by this queue. We were numbers 350 and 351 in the queue. It had poured heavily during the night and, as we were informed later, the first person to arrive started queuing at 11 pm the night before! As you can see we were all outside, so they, and scores of others, must have got soaked. After a couple of hours when we finally reached the front of the queue, our tickets were validated and we were free to book into the nearby hotel. Nice to be in the warm and dry. 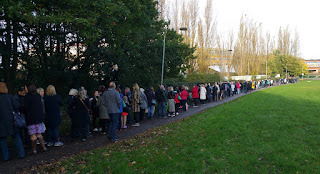 We were due to assemble in a large marquee at 3.45pm when we joined another five hundred or so lucky ticket holders. And as I’m still walking with a stick, we were able to join another dozen or so ‘walking wounded’ in a special seated area right next to the glass doors leading to the ballroom. Another hour waiting to get in but finally we were ushered into our special front row seats up a few steps behind the cameras. Great view - and at last we were there. The atmosphere was electric and although the stage looked a little smaller than it does on television, the lights, the sets, the glitter - everything was quite magical. Eamon Holmes (who’s wife Ruth was one of the celebrity dancers) came in carrying a large cushion to augment the rather small padded chairs, because of his recent hip operation, I felt quite envious as we were due to sit on our chairs for a full 6 hours! The live show lasted for two hours. It was great to watch Debbie and Giovanni dance the rumba. Which put them back on top of the leader board again. After the live broadcast was over we saw Debbie looking around the ballroom and when she saw us she came running around and up to have a hug and chat. 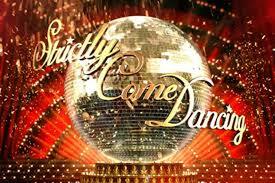 Soon the recording of the Sunday results show took place, together with a remarkable performance by the professional dancers called ‘Speed Dating’. Our Strictly day ended at about eleven o’clock when we walked back to the hotel with numb bottoms after our marathon sit-down on fairly small chairs. Next morning we drove down to Suffolk to spend a nice day with myf’s family. I’ve been bowling with the Henley Bowling Club for the past couple of years and have finally won my first trophy for winning the Points competition. 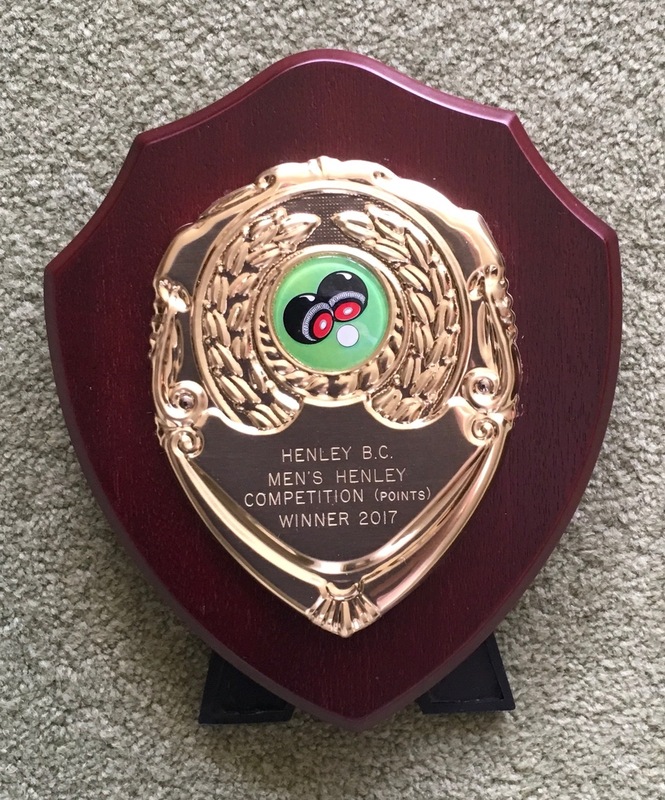 On Friday we went to the annual dinner and prize-giving ceremony at Henley Golf Club where I was presented with this shield. Yesterday we had a trip up the river. This will be the last of the year as I go into hospital on Tuesday morning to have a hip replacement operation so will certainly not be able to clamber in and out of boats for a few months. And tomorrow, it being my birthday, we are going to an arboretum in the Cotswolds where I’ve booked a ‘Tramper’ to drive around in style. Then back for a birthday dinner with my young friend at my favourite Henley restaurant.